Top Secret Welding Project Piques Interest of PassersbyPage 16Island Roads Begins Repairs To Damaged Section of Centerline RoadPage 4 TN SEE PAGE 3 January 20-26, 2014 Copyright 2014New Ferries Soon Come, No Major Hold Up, Says DPWSt. John Ferries Wait for USCG Inspections, Drills To Be Scheduled STORIES INSIDE ON PAGE 3 St. John Police Investigating Death Near Boatman PointPage 3 Genealogist Maps Out Petrus Family Tree for SJHSPage 8Defense Considers Calling Former Island Residents Grant Hayes as Witness in Amanda Hayes Murder TrialPage 7St. John Tradewinds News PhotosDoubleheader Inaugurates Basketball CourtThe bleachers were full of schoolmates, parents, family and friends for the See Story on Page 11. 2 St. John Tradewinds, January 20-26, 2014 The Royal family in Rehoboth Beach, Delaware, sent Tradewinds to remind people why we all love St. John.Audubon Society Meeting January 21 Coral Bay Open Set for January 25Come on out to Skinny Legs on Saturday, January 25, at 11 a.m. for the almost world famous Coral Bay Golf Open. This years with a shot-gun start. Bay, and a great party. Come out for the golf and stay for the after party featuring David T. Carter performing live. Islands National Park. will be an admission fee of $5 for adults 18 and up and entertain residents, visitors and historians. I think it will rival the parks [Virgin Island National Park] Annaberg ruins, Jones said referring to the VINPs restored sugar already stopping at the stand being operated by Jones wife on Health Center.Jones Family Opening Susannaberg Plantation Ruins to Public on Jan. 20 Dreaming of St. John on a Snowy, Cold Day EDITOR/PUBLISHER malinda@tradewinds.vi NEWS EDITOR jaime@tradewinds.vi COLUMNISTS & CONTRIBUTORS NEWSLINE www.tradewinds.vi editor@tradewinds.vi ADVERTISING advertising@tradewinds.vi MAILING ADDRE SS Tradewinds Publishing LLC P.O. Box 1500 CIRCULATION Call the newsline to be added as a newsstand site SUBSCRIPTIONS U.S. & U.S.V.I. only email: info@tradewinds.vi THIRD CLASS PERMIT U.S. Postage PAID COPYRIGHT 2014 photographs or advertisements allowed without written permission from the publisher. TRADEWINDS PUBLISHING LLCThe Community Newspaper Since 1972 St. John Tradewinds ing muddy stormwater runoff in Coral Bay and sentation by Dr. Sarah Gray of the University of San Bay and other areas of St. John for the past several plan for appropriate future solid waste management, What is a watershed? A watershed is an area where all the rainwater drains into the same natuIts up to all of us who live in and own land in tershed from all kinds of pollution so it is a beauresolutions. CBCC Hosting Two Community ForumsDr. Gray To Discuss Coral Bays Stormwater Runoff Research Jan. 21 Fee Free Day in Celebration of MLK Friends of the Library Meeting Jan. 23 view of the Friends initiatives followed by presentations by two guest speakers, Gilbert A. Sprauve on The Virgin Islands as a Library of the Caribbean. 4 St. John Tradewinds, January 20-26, 2014 ber O pen 7 Ni ghts a Week open 6 days closed sundays693.7755 o r w w w .la t apas tjoh n.c o m PO BOX 429, ST. JOHN, VI 774-1625 ACROSS FROM LIBRARY U. S. VIRGIN ISLANDS 501 (3) c NON-PROFIT ORGANIZATION By Jaime Elliott St. John Tradewinds the Upper Carolina subdivision to begin work on the most heavily after the road was initially daming that storm undermined several Several years passed as DepartFederal Highway of Administraaged areas of the roads. signed off on the roughly $1 milDarryl Smalls. I never said what areas of the St. John Tradewinds on Friday after noon, January 17. Ill be honest the threshold. however, for Fish Bay residents, as DPW is set to issue three adAnother year and a half would pass before DPW put the FHAnear the Upper Carolina subdivision tumbling down the hillside. and Coral Bay has been passbumps and warning signs in the area as they waited for the governin November. DPW issued Island January. In addition to the area of Cenlina subdivision, two other dampast the one lane area heading into past the Coral Bay overlook headAfter years of waiting, residents on the area last week. tell you, said one Coral Bay resifor work. I have been so worried every single time it rains and every time I drive over that area. Its underway. DPW Commissioner Smalls plained. We all want things to happen overnight, but I have to go through different ropes and get approvals, the blows in between its rough. Island Roads Begins Repairs To Damaged Section of Centerline St. John Tradewinds News Photo Road, above. By Jaime Elliott St. John Tradewinds Fish Bay residents were wondering what happened to dents who live near the damaged area of Fish Bay perhaps it didnt meet the threshold. St. John Tradewinds on Friday afternoon, January 17. for road work, said Smalls. They should be adver available as of press time, but more information on St. John Tradewinds, January 20-26, 2014 5 DPW Issues Bid Package for Fish Bay Road RepairSenate Overrides Governors Veto of Legislation for Collection of 10% Hotel Tax on Villa Rentals Canines, Cats & CrittersOur new location is 2.5 miles out of Cruz Bay on Centerline Road (next to Moses Laundromat) BOARDING GROOMING PET SUPPLIES tel: 693-7780 l email: k9 catscritters @yahoo .com WE HAVE FISH www.igbavi.org www.facebook.com/Island GreenLivingAssociationIts Time to Party! The ReSource Depot is located at Git Hill & Centerline, across from the Transfer StationTwo-year anniversary super sale and fundraiser at the ReSource Depot, Sat., Feb. 1, 10 a.m. 3 p.m.70,000 Thanks Help us celebrate 70,000 pounds of waste kept out of local landlls with: Fantastic rae prizes, like this gorgeous mahogany table, handcrafted by local woodworker Matt Mueller and donated to IGLA by Frank Barnako Live music by the Stangerz St. John Tradewinds News Photos by Kelly Morris Road, above and at left. By T om Oat St. John Tradewinds Villa owners on St. John and throughout the territory will be payafter the V.I. Senate overrode several vetoes by Governor John deary 14, the V.I. Senate overrode several of Governors vetoes of legisOne provision vetoed by Gov. deJongh from the Omnibus bill taxes, Gov. deJongh said the mandate violated the separation of powTime To Increase Fairness Sen. Barshinger told Tradewinds People feel its better to pay tribute to the deJongh administration rather than pay taxes, Sen.Barshinger added. Some people are paying, Sen. Barshinger reiterated. We should all be in this together. 12 St. John Tradewinds, January 20-26, 2014 Enjoy Stunning Sunsets in High Style at Rileys Retreat in Estate PastoryBy Jaime Elliott St. John Tradewinds bury sound to St. Thomas and even out to St. Croix with views of Pillsbury Sound and St. Thomas, Donmahogany trim throughout, beautiful island stone and genuine Venetian plaster walls. The upper level The master bedroom boasts a grand en suite bath outdoor shower as well. All three bedrooms have new island. view downstairs either, Donnelly added. view, she said. Park, the large pool might keep you home at least a few days. The pool area is very private and also has a hot bathroom. Stockwell Speaking at UUF Service Boulon Painting Supports Arts SchoolSt. John Tradewinds framed, original oil painting, Whistling Cay To Jost Van Dyke, valued at $1800, by Boulon Fine Art Gallery at The Virgin Islands National Park. or 6 for $50 and may be pur Thursdays and Fridays from ning With The Arts from 5 to 8 p.m. where the drawing will be present to win. serve to be happy? Is someone or something supposed to make us happy? Does laughter make us happy or does being happy make us laugh? Can you be sad and happy at the same time? Lets see what St. John from Wednesday, January 22, through Sunday, January Reggae Roadblock Happy Hour Jan. 22 Hush The All-Inclusive Villa Soiree Jan. 23 Rockers All-White Reggae Beach Party January 24 The Ultimate PowerBoat Party January 26 Love City Live! 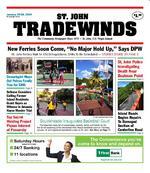 Events Start January 22 St. JohnTradewinds News Photos Retreat. St. John Tradewinds, 28 The 28th Annual Gifft Hill School Auction Saturday, March 8th, 2014 Caneel Beach TerraceSt. John Virgin IslandsFor more information call 776-1735, or e-mail mollymurrill@giffthillschool.org SAVE THIS DATE! PSSSST!SO . YOU PLAY GOOD TENNIS? BUT CROWDS MAKE YOU NERVOUS??? (especially WHEN the BIG TOURNAMENT LOOMS! )WELL, THEN . JOIN US AT THEMARTIN LUTHER KING, Jr. TENNIS FUN DAY!BRING YOUR RACQUET . WEVE GOT THE BALLS! BRING YOUR GRUDGE . WEVE GOT THE CHEERS AND JEERS!!! COME HUNGRY . WE PROVIDE THE NYAM! PLACE? THE CRUZ BAY PUBLIC COURTS. WHEN? (OF COURSE) ON MARTIN LUTHER KING, JR. DAY (January 20, 2014) STARTING AT 10.A.M., WITH PLAY ALL DAY! (Contact Gil Sprauve 344 or Pat Harley 513) St. John Tradewinds New Year greetings from the 6 meeting where nominations are made for positions on our board right after the board meeting. would like to be a part of our great ber. Supporting members are those who prefer not to respond to medito help with administrative work John either full time or seasonally and would like to share some of a supporting member you will not be required to respond to emergenule. ber we responded to the following Trunk Bay Grunwald down off St Thomasunfounded the Governors Christmas Party for Children sessions for a total of 171 operations. To The Rescue New Members and Supporters Needed Anyone interested in taking register. 25 the annual Coral Bay open golf tournament will be held at Skinny attend this fun event and help us sold by members with some great T shirts. These rugged light blue member at Star Villas, or at High Tide Bar and Grill at Wharfside Village. er of St. John who would offer us vide the funding to us. Paying off a help to us. Until next month, stay safe. By Jim Furneaux St. John Tradewinds around Two Brothers and Stevens Desperado St. John Tradewinds, January 20-26, 2014 17 St. John Tradewinds News Photos by Jim FurneauxCLOCKWISE FROM BOTT OM LEFT : closes on MT at the start of spinnaker class winner Desperado, Bob Melttemi Heavy W ind Makes for Aggressive Racing in Dukes T rophy Race ALCHOLICS ANONYMOUS MEETINGS NARCOTICS ANONYMOUS MEETINGS AL-ANON MEETINGS and youngster Colin Brego steered Stinger20 knot winds with frequent wind attempts to set spinnakers proved in MT We had a sudden gust as we our spinnaker. said Feierabend. The few minutes it took to sort Wild Ting, a 40 Dufour, took the early lead and led the spinnawas here that Desperado up some ground. giving us a big lift, said Pessler. Still Wild Ting would have taken go. For us the little things added up being in phase with the large wind T OP FINISHERS BY CLASS: Spinnaker 1. Pessler 2. Boat Drinks, Capt.JP Non-Spinnaker Stinger Capt. Colin Brego 1. 2. Harrellson start off Two Brothers. Sunday. St. John Tradewinds, January 20-26, 2014 21 Call 340.779.4940 to book today!Visit www.friendsvinp.org/seminars or pick up a brochure for more details! Meet: Bring: Seminar Fee:Max Group: Meet:Bring: Seminar Fee:Max Group: Meet:Bring: Seminar Fee:Max Group: 25 Meet: Bring: Seminar Fee:Max Group: 12 Meet:Bring: Seminar Fee:Max Group: 25 Meet: Bring: Seminar Fee:Max Group: 8 Meet: Bring: Seminar Fee:Max Group: 25 Meet: Bring: Seminar Fee:Max Group: Meet: Bring: Seminar Fee: Meet: Bring: Seminar Fee:Max Group: Meet: Bring: Seminar Fee:Max Group: Meet:Bring: Seminar Fee:Max Group: Meet:Bring: Seminar Fee:Max Group: Meet: Bring: Seminar Fee:Max Group: 28 Meet: Bring: Seminar Fee:Max Group: Meet: Bring: Seminar Fee:Max Group: 25 Meet: Bring: Seminar Fee:Max Group: Meet: Bring: Seminar Fee:Max Group: Meet: Bring: Seminar Fee:Max Group: Meet: Bring: Seminar Fee:Max Group: Meet:Bring: Seminar Fee:Max Group: 25 Meet:Bring: Seminar Fee:Max Group: Meet: Bring: Seminar Fee:Max Group: 18 Meet: Bring: Seminar Fee:Max Group: Meet: Bring: Seminar Fee:Max Group: Meet: Bring: Seminar Fee:Max Group: Meet: Bring: Seminar Fee:Max Group: 15 Meet: Bring: Seminar Fee:Max Group: Meet: Bring: Seminar Fee:Max Group: 18 Meet: Bring: Seminar Fee:Max Group: Meet: Bring: Seminar Fee:Max Group: 15 Meet: Bring: Seminar Fee:Max Group: 15 Meet: Bring: Seminar Fee:Max Group: Meet: Bring: Seminar Fee:Max Group: 6.4 Magnitude Earthquake Shakes Island of Puerto Rico St. John Tradewinds grees West longitude, at a depth of 17.4 miles approximately 85 miles ed. At 12:04 a.m. today the National Tsunami Warning Center at Palmer, the earthquake was not enough to generate a tsunami. earthquake had been felt. For more information about earthquake preparedness, visit www. St. John Tradewinds 18th and ends on Thursday February 27th, 2014. between the hours of 6:00 p.m. and 8:00 p.m. 2014. T O REGISTER STUDENTS MUST BRING: A money order or bank draft for $100.00 made out to the Government of the Virgin Islands information.Registration Upcoming for Adult Continuing Education Programs Second SemesterAdult Continuing Education Program Looking for TeachersSt. John Tradewinds Anyone interested in one of ell@doe.vi. TRADEWINDS SUBSCRIPTIONSSend Check Payable to Tradewinds Publishing LLC P.O. Box 1500, St. John, VI 00831 1 YEAR SUBSCRIPTION $90.00 USD Name ____________________________________ Address ___________________________________ ___________________________________________ Email ____________________________________ Telephone/Cell ___________________________ St. John Tradewinds, January 20-26, 2014 27 COMPLETE REAL ESTATE SE R VI C ESST JO HNS OLD EST R EAL ESTATE F I R M SE R VI N G ST. JO HN F O R 54 YEA R S! INFO@HolidayHomesVI.com TOLL FREE: WWW.HOLIDAYHOMESVI.COM YOU CAN SEE FOREVER Exceptional BVI views from nearly acre, 2 home property on lower Bordeaux. Large cottage with kitchen & living room area, bdrm, bth, sleep loft & wraparound porch. Second cottage is roomy efciency with full kitchen, bath & lovely front view porch. Live in one & rent the other! CORAL COTTAGE This cute 3 bdrm Caribbean cottage sits on the hill side above Coral Bay with views from Virgin Gorda to Jost. Decks make it a per fect short term rental, on paved road minutes from town. COQUI COTTAGE Caribbean cute and ready to be loved! Studio layout with king bed in a solid masonry building makes a great start on this .5 acre lot. ROTUNDA A private, gated estate in Upper Peter Bay bordering pristine VI National Park. 5 bdrm/5.5 bth villa w/ lavish outdoor bar, in nity edge pool, sen sational views across St. Johns North Shore to the BVIs. Beaches minutes away! VI FRIENDSHIP VILLA Cliff side along the waters edge of Great Cruz Bay. 6 bdrm suites, exercise room, game room & private sandy beach. This villa offers high quality waterfront living w/ luxurious amenities & view of your boat in the harbor below! CINNAMON BAY ESTATE borders Ntnl Park in Catherineberg, private, gated setting, 3 bdrms, 23 ft wall of glass & outstanding views. Spacious living areas, wrap around decks, expansive sundeck, large pool, elevated spa & covered dining. PETER BAY GATEHOUSE an ex quisite 2 bedroom villa on large lot in Peter Bay Estates has great views and breezes. Michael Oxman plans avail able for expansion. Incredible Value! VILLA MARBELLA Own this stunning 3 bedroom and 3.5 bath custom Virgin Grand Estates villa. View pool and large veranda. Great rentals and sunsets over St. Thomas and Pillsbury Sound. One level living with fabulous Great Room! STONE POST COTTAGE Caribbean charm on a 1.5 ac. lot of lush tropical gardens in Chocolate Hole. 3bdrm/3bth main house, stone guest house, & a small island cottage. Spacious deck wraps around 55x15 lap pool, spa and gazebo. SAVE WAPA COSTS! SEA TURTLE VILLA is a green SOLAR NETMETERED contemporary home that cash ows! Amazing water views, sleeps 8, tropical landscaping, pool, & open architecture set amidst secluded privacy. PARADISE ON THE ROCKS Tropical living, big views & masonry home-centrally-located on Ajax Peak. Two units: 2 bedrooms, 2 baths and great room upstairs; private entry 1 bedroom apartment downstairs. Rent one, live in the other! WHALE WATCH Enjoy pristine East End in this lovely, 2 bedroom villa with big water views. Downstairs apartment offers additional living & income space. Hear the sound of the waves lapping below . ENIGHED GARDENS is a 5x4 masonry home in gated .46 ac. garden setting with spectacular views over Pillsbury Sound. Flexible oor plan, expansive decks, wonderful potential as is. LOVE VIEW TOO 2 br/3bth w/ sweeping views to East End & BVI. Concordia home near Salt Pond Bay and US National Park is all-masonry construc tion w/ pool. Villa w/ pod living is ide al for rental or family retreat. FISCH BAY 2X2 This charming well built home has many unique tile details and is sur rounded by lots of fruit trees. Solar panels net metered for low electric bills. The Company that gives back to St. John$1,125,000 MLS 13-204 LAVENDER HILL Luxurious 1 bedroom unit adjacent to pool with 2 decks. Walk to beach and town. Handsomely furnished, immaculately maintained, excellent rental man -agement. $499,000 MLS 12-249$2,395,000 MLS 13-499 $7,485,000 VIDEO MLS 12-424 $3,599,000 MLS 11-186 $1,999,000 MLS 10-381 $1,295,000 VIDEO MLS 13-432 $1,150,000 MLS 13-470 $790,000 MLS 12-139 $372,500 MLS 13-498 $599,000 MLS 14-25 PRICE REDUCED! GALLOWS POINT Unit 9Cone bedroom, 1.5 bath loft with private deck/ patio, common beach, pool and spa. Restau rant and concierge services on property. Walk to town! $1,100,000 WATERFRONT MLS 11-187 $1,950,000 MLS 13-7 VIDEO PETIT TRESOR (a small treasure) at Cruz Bay Villas is a charming onebdrm condo w/ a romantic view over the pool & across Pillsbury Sound to St. Thomas. Pool with wrap around deck and great sunset views! $325,000 MLS 13-86 $795,000 MLS 13-128 $659,500 MLS 14-20 $615,000 MLS 13-346 NEW LISTING NEW LISTING PRICE REDUCED! $4,599,000 MLS 13-512 VIDEO SEARCH ENTIRE ST. JOHN MLS, VIEW PROPERTY VIDEOS AND NEWSLETTER/SALES HISTORY AT WWW.HOLIDAYHOMESVI.CO M LOTS OF LAND LISTINGS!! MOTIVATED SELLERS!! SOME SELLER FINANCING!! CAROLINA from $ 55,000 EMMAUS hillside $ 75,000 FISH BAY from $ 79,995 HANSEN BAY hillside & WATERFRONT $ 144,000 CHOCOLATE HOLE from $ 175,000 GLUCKSBERG from $ 199,000VIRGIN GRAND ESTATES from $ 206,000CALABASH BOOM hillside $ 229,000 LOVANGO CAY South shore from $ 250,000CONCORDIA from $ 295,000UPPER MONTE BAY/RENDEZVOUS from $ 799,000SABA BAY hillside & WATERFRONT from $ 999,000 PETER BAY/NORTHSHORE from $ 1,500,000 WESTIN TIMESHARES from $ 500/weekONE MONTH FRACTIONALS from $ 54,000 HH-TW 1.20.2014 A.indd 1 1/17/14 3:09 PM Employment EXPERIENCED MAINTENANCE PERSON Tutor Available TUTOR AVAILABLE: EVERYTHING YOU NEED ON EVERY LEVEL GREAT PLACE TO SHOP, DINE AND WORK COME JOIN US WE HAVE SPACES AVAILA BLE RETAIL, OFFICE OR STORAGE340-776-6455 Commercial/Ofce STORAGE: AUTOS 643-3283 PASTORY SELF STORAGE Available Immediately 5x5x8 up to 10x20x8 340-776-1330 Storage READING SPECIALIST AND TUTOR WITH 10+ YEARS EXPERIENCE. COMMERCIAL/RETAIL SPACE available for 1.480.626.7571 for further information. BUYING? SELLING? RENTING? SEEKING?CALL: 340-776-6496 EMAIL: advertising@tradewinds.vi employ one or both of the following: 1. 2. Coral Bay and its businesses. CBCC is an Equal Opportunity Provider and Employer and has a Drug Free W orkplace Policy.